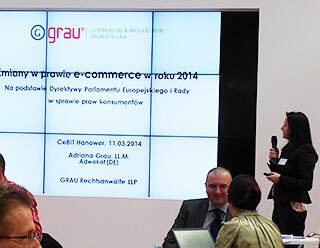 After successful cooperation in 2013, GRAU Rechtsanwälte LLP was again chosen as the consulting partner to the Polish Ministry of the Economy at CeBit 2014 in Hannover. This trade fair is the world’s biggest one for information technology. 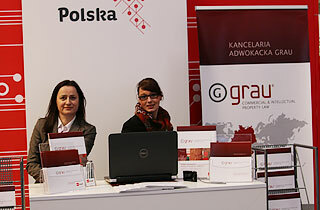 As in 2013 GRAU Rechtsanwälte LLP was part of Poland’s presentation, offering advice to numerous Polish entrepreneurs on topics related to business activities in Germany. These included issues on trademark protection, intellectual property law concerning computer programs, patent registration and various types of business activities and sales of goods in Germany. Adriana Grau, LL.M. got particularly positive feedback for her presentation in Polish on the topic of “Changes in e-commerce in the year of 2014”. This presentation included a complete overview of the current developments in the sector. Adriana Grau LL.M. Attorney at Law informs entrepreneurs about “Changes in e-commerce in the year 2014”. GRAU Rechtsanwälte LLP is specialized in legal counseling in the areas of Intellectual Property, Competition Law, Distribution Law, as well as Commercial and Corporate Law. GRAU Law Firm advises national and international, as well as mid-sized and large enterprises in these areas. Our clients include foreign companies marketing and distributing their products in Germany. In addition, GRAU Rechtsanwälte LLP offers companies professional and effective Debt Collection Management, managed by an attorney at law. Many entrepreneurs took the chance to receive legal counceling regarding topics of transnational business. Located in the city of Hannover, CeBit is the world’s biggest trade fair for information technology. As a meeting point for entrepreneurs, leading journalists and bloggers, Cebit is well known for bringing together world’s leaders in the area of information and communication technology. Each year focusing on a particular country, in 2014 the main focus of attention lays on Great Britain.